Looking for an air purifier that also heats and cools the air? Look no further than the Dyson Pure Hot + Cool Link 3-in-1 Air Purifier. There are few 3-in-1 devices on the market, and as far as quality is concerned, this is the only we would recommend for that. Dyson is known for futuristic award winning design and innovation, and this product falls in line; however, there are a few drawbacks. The Dyson Pure Hot + Cool Link 3-in-1 Air Purifier uses a HEPA filter, that removes up to 99.97 percent of particles .3 microns or larger (however, it isn’t certified as TrueHEPA). It boasts 360 degree functionality and can filter air from all angles. This de-emphasizes the importance of where to place your air purifier. The Pure Hot + Cool Link also contains an activated carbon filter, however it has been found by some users to be relatively worse than other similar filters in dealing with household smells. While Dyson boasts about the quietness of this unit, we’ve found it is not meaningfully different from other air purifiers. We don’t have decibel information available. It isn’t loud per se, but most air purifiers operate in the same range, including this one. The unit can automatically switch itself on when it sense air purity levels are below a certain standard. It can also turn itself on if it detects the temperature is out of your desired range. There is a SMART version of this air purifier available, which you can control through an app on your mobile devices. There is also a digital display to alert to you when it’s time to change the filters, and to display the temperature. Dyson offers a 30-day money back guarantee, which should be enough time for you to test it out. If it doesn’t work, then you should return it. Additionally, Dyson also provides a free limited 2-year warranty, covering labor and replacement parts, but excluding the filters. This warranty is better than most other air purifiers available, and you are signed up automatically via the app on the SMART version. The most obvious advantage is the 3-in-1 functionality. This saves on device costs if you need 3 separate devices, and will also save space in your home or office. As far as the Dyson Pure Hot + Cool Link 3-in-1 Air Purifier is concerned, it can do the job, but there is better bang for your buck out there. This is especially true if you already have heating and cooling solutions in your home. If you have serious respiratory or environmental issues, you’ll probably want to rely on a more powerful HEPA and carbon filter. On the other hand, the device packs in a lot of functionality and design, and if you want to save space, and happen to need all 3 devices. Why not? I recently visited a local vape shop and (legal) marijuana dispensary to discuss what kind of air purifier they used. I wanted to find out from real life users of air purifiers, which models they found most effective for vaping. What better real-life user than a vape shop! What I found was nothing short of a full-out assault on air impurity. The owner carefully selected everything in the store to lessen any damage that might happen. The materials of the store fixtures, the paint on the walls, the flooring, the decorations – EVERYTHING — was in need of protection. In addition to a central air conditioning system, he was running several air purifiers at once. The owner told me that they re-designed the store after discovering the vapor (from vapes and electronic cigarettes) leaves a subtle, but difficult to clean, residue, which builds up over time. This is why you need a good air purifier, and you very likely need a dehumidifier too. Looking for a quick answer as to which Air Purifier is best for you? Click here to take our quiz! Want to do your own research? Read on! 1.2 What is in eLiquid? 2 How does Vaping affect my lungs and health? Vaping is heating (and inhaling) a substance, most commonly e-liquids for electronic cigarettes or some forms of marijuana or hashish. When you exhale, you are breathing out a gaseous substance that looks like smoke but isn’t (it is vapor). Smoking uses fire to burn the substance. You inhale the smoke that comes from that burning process. This is unhealthy for a lot of reasons that are well known to most people. Vaping, on the other hand, applies heat to the substance (but not fire) until it transforms into a vapor. Unless you put tobacco in your vape, the products themselves are often tobacco-free, and sometimes nicotine-free, (compared to a traditional cigarette, which is not). Vaporizers tend to be used for marijuana, which often goes into the device as a dry herb before it is vaporized. They can range in price from less than $50 to over $300. Electronic cigarettes turn e-juice or e-liquid into vapor and is far more commonly seen in public, along with the thick, white plumes of vapor that is exhaled, and which looks a lot more substantial than cigarette smoke (but is almost certainly less harmful, see below). E-cigs come in disposable forms that are inexpensive, or in higher quality devices that can cost up to $200, and are more like vaporizers. eLiquid is comprised of base flavor ingredients, usually consisting of Propylene Glycol (PG), Vegetable Glycerin (VG) or both. Most e-Liquids have mixes containing 70% PG/ 30% VG or 50% PG/ 50% VG. PG and VG are combined with natural or artificial flavors like citrus or cinnamon to create unique blends and flavors. Propylene Glycol is a common, non-toxic flavoring carrier in food products, food coloring and is also found in several medicines. A blended PG/VG base is smoother than a 100% PG base. Vegetable Glycerin is a non-toxic vegetable-based liquid. On its own, it is too thick to vaporize effectively, which is why you see it blended. How does Vaping affect my lungs and health? When water vapor condenses, the water is absorbed into the bloodstream. Because PG and VG molecules are big, they will mostly not be absorbed by most people. Human lungs have a process that allows for non-absorbable particles to be cleared – you see this in action when you cough up mucus – and this is what will likely become of the PG/VG not absorbed. You will spit it out or swallow it. Most likely you will swallow it because not all of it will make itself ready to be spit out, i.e. travel up and into your mouth. Flavorings are separate from PG/VG and behave differently in our systems. Each flavoring will have a different chemical profile, making it difficult to determine categorically what their fate will be once in your system. Most of the vapor, you exhale, after that, some will be absorbed into your lungs, and some may come out in your mucus or be swallowed and then processed in your body. In comparison to cigarette smoke or other tobacco products like cigars, you are inhaling a variety of toxic chemicals, some of which are present in the cigarette mixture, and many of which are the byproduct of lighting the cigarette on fire. There is a lot of literature on why this is bad, but the ultimate difference is that your lungs, relative to dealing with PG/VG, are not good at dealing with cigarette ingredients. It is important to keep in mind that no definitive studies have yet been conducted by reputable scientists. So while we have some ideas, we don’t have a definitive idea that has been well researched. From a health perspective, vaping is almost certainly better than smoking. Still, we know that PG and VG are commonly used substances for many applications they are listed as verified excipients for inhalation by the International Pharmaceutical Excipients Council. This shows that there is some consensus that there is little risk in long-term use in vaping PG/VG. Most flavorings are generally volatile, chemically. Because they are volatile, they are more likely to be cleared from the lungs rather than absorbed into the blood. If the eJuice being used is sourced from a reputable place, they are then certified as generally safe; however, this certification is not widespread, even where it applies, unfortunately. Still, there is a reason to be hopeful that vaping flavors to be absorbed in the lungs is roughly as safe as consuming those flavors orally. As to how it affects the lungs, in particular, no one is certain. It would take a lot of time and money to find out each flavor variant’s effects. More likely to happen is the scientific community do broader studies to reach a general consensus. Ultimately, if you are concerned about how vaping will affect your health, vaping appears preferable to smoking. This goes for cigarettes, cigars, marijuana and any smoked substance. Here are a few examples of large, national bodies weighing in on the topic. It is mostly the same for marijuana as it is for eLiquid. There aren’t any large scale and reputable studies, but it is thought to be a lot safer to vape than to smoke. Most people are content to proceed on the consensus and not wait for studies to emerge, which could take many years; however, vaping marijuana isn’t 100% risk-free. There are still all of the potential risks associated with marijuana consumption (regardless of HOW it is consumed). Some people have voiced a concern over whether there is a risk of heating the cheap plastic parts in your vaporizer (when it is heating your marijuana), and whether that could increase the odds of breathing in plastic particles. If you are vaping hash oil (BHO) rather than dry bud, there is an increased risk that it has been mixed with other unknown chemicals. It is likely better than smoking, and it is likely better than blending tobacco into your dry herb, but there is always an unknown risk if you aren’t sure of the composition or source of your substance. It looks obvious that smoking anything is bad for you. The little research, combined with anecdotal evidence suggests that vaping is not nearly as bad as smoking, due to the reduction of carbon monoxide intake, among other factors. Apples still contain glucose, so there is nothing that is 100% perfect, but apples are still healthier than deep fried ice cream. So if you are thinking of switching from smoking to vaping, you are doing yourself a big favor. You can also increase the safety by keeping the air clean where you live and work. It is, therefore, an advisable precaution to use an air purifier to address the potential harms, and also to help eliminate the residual odors of the flavoring released into the air. The vaping element also introduces a humidity issue, where, compared to smoke and other air pollutants, humidity control is not as much of an issue. For this reason, we recommend that heavy vapers use both an air purifier and a dehumidifier. These devices can be purchased either separately or in a combination device. You won’t notice any residue the first time, even the first several, you vape in your house or car. If you only vape every so often, you may never experience a residue on your things. However, heavy usage – daily or more often, and depending on the size of the room you’re in and its circulation – you may find that the vapor leaves an obvious residue on walls, ceilings, and things inside the room. While it may not stain your things, you will find it incredibly difficult to clean. Certain paints, and harder to clean objects like rugs and carpets, are especially tricky. On most surfaces, a damp cloth will clean off the film. On many other surfaces, however, water won’t be effective. For examples, fabrics and painted surfaces are difficult to clean. One side effect of this residue is that it will amass common air pollutants like dust, pet dander, and other common debris. It can also get into your ducts and vents. You truly do not it want in there. It will impair the quality of the output of your ducts and vents, and the quality of air coming out of them. You’ll notice the film on your electronics and decorations. Anything that sits idle over a period of time while you vape is exposed. Again, a casual infrequent user won’t experience this, only those consistently and frequently vaping. This is why heavy vapers will want to use both an air purifier and a dehumidifier to tackle the issues presented by the use of a vaporizer in your home or car. There are many ways to purify the air in your home, by improving circulation and airflow, or by keeping plants, you can effectively clean contaminants out of the air. However, you can’t always perfectly control air flow, and maintaining plants requires a lot of upkeep. If you’re an avid vape user, an air purifier and dehumidifier combination is a simple and effective solution, especially if you live in a humid place with known contaminants. Excess moisture creates an environment for mold and mildew, which will lead to bad smells and damage to your home. It is also not safe to breathe in. If you vape, then you want to make sure you are not exacerbating the issue. A dehumidifier and air purifier can address this by filtering contaminants out of the air. Compared to smoke, air purification is less of concern when it comes to vaping. For a small room, we would recommend the GermGuardian, because it is great value for the price. If you want to buy an air purifier for other reasons, please read our Buying Guide. Humidity, on the other hand, will be the primary concern. Ideally, you’ll keep the humidity levels below 50% to help control problems like dust mites, for example. We HIGHLY recommend the Frigidaire FAD504DWD. It will capture 50-pints of humidity. If you like a little humidity, you can set it to your preferred humidity level, anywhere between 35% and 85%. You can also set a timer if you want to control when it runs. It weighs about ten fewer pounds than larger, more robust 70-pint models. The Keystone KSTAD50B Dehumidifier features a great control panel to help you operate it with minimal work. The speeds range from Normal or Turbo, allowing you to adjust it to your environment. It comes with an auto-defrost feature to remove frost from its evaporator coils. Additionally, it comes with a removable dust filter. It is Energy Star certified and has a volumetric capacity of 50 pints, though we prefer the larger model. It suits spaces up to 4,500 square feet. You now have the fact about vaping and what risks it might pose to you and your environment. We’ve also looked at ways to help protect your environment from humidity and pollutants generated by vaporizers. Be sure to stay current on best practices for healthy vaping. We will keep this page updated with new information when it becomes available. If you’ve googled about air purifiers before, chances are you’ll be targeted for ads by RabbitAir, and you should definitely check this model out. The Rabbit Air MinusA2 boasts a tremendous performance, and is perhaps the most technologically advanced air purifier on the market today — not necessarily in terms of its air purification, but in terms of its overall design. It is far less of a detriment to your space, and is powerful enough for your air filtering needs, and its price is reasonably competitive given all of that. This air purifier is remarkably only seven inches in depth. While that makes it easy to place, as is the case with most air purifiers, you won’t want to use its shallow measurement to tuck it away. To get the best performance out of the RabbitAir, you’ll want to place it centrally. Luckily, it also looks great! It is made for mounting on a wall (although it can also stand on the floor or on a counter-top or desk), but again, placement of the RabbitAir is key to your air purity success. It’s size is extra impressive given that it has been rated to be effective in rooms up to 815 square feet. Other air purifiers in this class tend to be much larger, and look more like… well… air purifiers. NOTE: There is a baby brother model that has been rated for rooms up to 700 square feet. The Rabbit Air MinusA2 comes equipped with a six-stage filtration process – which is above the standard of 3, and above the stand out air purifiers boasting 4. 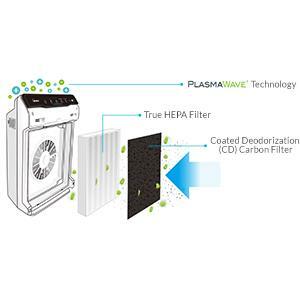 The BioGS HEPA filter is made of fine mesh that targets impure air. Although it is rated as being able to filter out 99.97% of pollutants over 0.03 microns, this HEPA filter has not been rated as TrueHEPA. However, there are still five more filters in the Rabbit Air MinusA2, so it’s not lacking form that standpoint. A nice feature of this model is that you can select one of four additional kinds of filters. In other words you can customize the Rabbit Air to address a specific issue you have with your air. You can select this add-on filter if you need to reduce strong smells in your home, whether from cooking, smoking, cleansers or other sources like pets or mildew. The toxin filter is great for chemical compounds you may have in your air like paints or other similar products. If you have allergies to pets then you’ll want to select this additional filter to target pet dander and other airborne allergens. If you happen to have a lot of germs in your space, maybe your kids are in day care or you work in a medical field, then this filter will target viruses and bacteria. A nice additional feature, if you prioritize design, is that you can purchase a customize-able facade for your air purifier. The Artist Series includes an assortment of front panels with artwork from cannonical artists like Vincent van Gogh (Starry Night), Katsushika Hokusai (The Great Wave), or many other designs. There is even a limited-edition Charles Schultz’s Peanuts cartoon, which is great for a nursery or kids room. The RabbitAir Minus A2 comes with a great warranty of 5 years of coverage for parts and labor. Not as good as the Alen BreatheSmart, but better than most!. 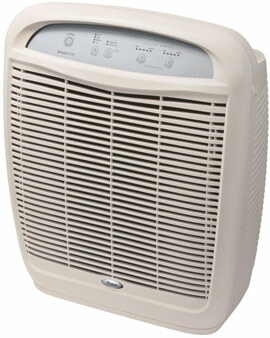 The RabbitAir Minus A2 air purifier has a fairly low CADR for similar air purifiers in its class (193). It’s HEPA filter is not technically TrueHEPA. Some of its reviewers have questioned the effectiveness of the add on filters in addressing smoke and odor problems. While the design options are great, does it justify the expense compared to some of the heavy hitting air purifier technology? (That will be up to you to decide). It also does not include a timer, so if you wanted to program the air purifier to run while you left to run errands, you’d have to just leave it on instead. Not a huge deal-breaker for most people, but worth mentioning. Rabbit Air has made a great air purifier and very sleek and well designed. In most circumstances, it will serve you well. I would say it’s especially good for office spaces. It can fit in with office decor very easily, and is also powerful enough to cover a larger area. If you have more questions about the RabbitAir Minus A2, please feel free to give us a holler or head on over to Amazon to see what people are saying in the comment threads. But for how it looks, the Honeywell 50250-S Air Purifier is a solid machine that can efficiently handle spaces under 400 square feet. My only real issue is that it looks like a medical device, but let’s discuss all of the pros and cons, because this one has some strengths also. Honeywell is a home appliance brand that tends to do things by the book, so it’s no surprise they have obtained industry certification for this air purifier. The CADR for the Honeywell 50250-S is consistently scored at 250 for each of pollen, dust and smoke. This machine has an activated carbon pre-filter to capture bigger particles before the HEPA filter is engaged to handle the tougher particles. It comes with a True HEPA filter than can be vacuumed and will last up to 5 years if maintained well. A nice feature is that the replacement HEPA filters for this unit aren’t insanely expensive, as we have seen with some other units. The Honeywell 50250-S Air Purifier is a round machine, which is a little unique, and at a minimum allows Honeywell to a patented air-flow. Our jury is out on whether this is truly more effective than other kinds of air flows, but the circularity is nice, especially as we find the other design elements lacking. This is a louder unit than other available air purifiers, but at least you know that it’s working. Some people like the noise, and can use it as a noise machine while they sleep. If that’s the case for you, then please feel free to add this to the PRO pile, but we left it here for now. Some people don’t like too much light to come off their units, and this air purifier does have a blue light that is noticeable. Not that you would leave it on your house for Christmas, but you’ll notice it. If it has to go in a baby’s room for example, and your concerned about waking your baby, it will cross your mind that maybe it’s too bright. Finally, this is pure preference, but this model looks like too much like a medical device to me. I like the circular aspect, but the grill and white plastic are put together in a way that would make me want to hide this machine, compared to some of the sleeker designs available today. When push comes to shove, this Honeywell 50250-S Air Purifier does exactly what it’s supposed to do. If you can find it on sale, all the better, especially as the filer replacements are also not going to break the bank. Just know that if you are like me, you might notice the look, and the light and the sound of this machine, a little bit more than you want to. A lot of people can live with that, especially if a cost savings is involved, so feel free to check the price on Amazon, and if you have any questions, don’t hesitate at all to ask. The Winix PlasmaWave 5500-2 is a terrific bargain. If you have allergies, it probably will be the best bet for your dollar. Obviously, there are many reasons why you would want an air purifier in your home or office, but the most common reasons from our experience are asthma, smoking, pollution, mold and certain allergies. All of these are not only incredibly common, but they can compound your breathing and health problems if you have to somehow tackle many of them at the same time, which is unfortunately. Here’s why the Winix PlasmaWave 5500-2 air purifier is a great choice. 1.1 Is PlasmaWave a Marketing Term? Is PlasmaWave a Marketing Term? Maybe, but the bottom line is that this air purifier is both powerful and efficient. According to the manufacturer, the PlasmaWave technology helps to remove ozone form your space, which is a common problem with ionizer air purifiers. Ozone isn’t something you want to breathe a lot of, and if you have ever had a smell professionally removed from your car for example, then you would have been told the same thing. In the first tier, particles are trapped in a pre-filter containing active charcoal aka carbon. Unpleasant matter that is large, for example, dust and hair are tackled in this stage. Second, smaller airborne matter that sneaks past the first filter then hits the HEPA filter, which, as you may know from reading this page, captures ridiculously small particles like pollen and also certain airborne illnesses. Finally, the PlasmaWave Technology is unleashed in the third stage, which basically adds electrical charges to particles in order to filter them. A visual on three-tiers of filtration. This air purifier is insanely quiet. It boasts a 4 speed fan, and a sleep mode, and a turbo mode. As with all air filters, a lower fan speed is quieter and uses less electricity, and higher fan speed means air is cleaned more quickly. Some people have found the higher speed settings a little more noticeable. This air purifier also includes the helpful feature of automatically detecting the air quality and adjusting its settings based on the input to the filter. Why drive manual when you can drive automatic? You can just set it and forget it. The Winix PlasmaWave 5500-2 wins the mid-class range by leading in some important categories: CADR ratings of 243 (dust), 232 (smoke) and 246 (pollen), which means it will clean out a room of those sizes (in cubic feet), which is filled with those things in one minute. It changes the air in a space about 5 times per hour and is therefore recommended for rooms of up to 360 square feet in size, but for this particular unit, you are probably better off in a room smaller than that. The 5500-2 comes with a washable filter, and is better looking than most other air purifiers available (granted, subjective, but this can sit in most spaces without being too much of an eye sore). The lower speeds on this model are not as powerful as you might want for a larger space. Some people complain that for use in a bedroom the lights on this model are intrusive. If you want to save a few more bucks, there is a predecessor model to the 5500-2, which is the Winix PlasmaWave 5300, which does not include a remote control or washable filter (the 5500-2 does include both). The Winix PlasmaWave 5500-2 will probably suit you also for a condo or apartment if you don’t mind moving it around a little bit. It has many helpful features at a very competitive price. It has a fairly large filter, which is helpful in that it requires less changes. It’s a really solid option for your space, almost irrespective of what impurities exist in our air, thanks to its 3 tiers and PlasmaWave filter. You can find the 5500-2 here on Amazon, at a great price, but you may want to check earlier models as well (if they are still available). I own the Whirlpool Whispure 51030k and use it in my basement. My family’s health is important, and I trust this air purifier to to tackle all the impurities in my air that put stress on our bodies, leading to poor rest and poor health. If you care enough to eat healthy, then you probably care enough to breathe healthy also. The Whirlpool Whispure 51030K Air Purifier does an amazing job of cleaning the air in my home. Whirlpool is and old and reputable brand for home appliances. This model uses the standard combination of a pre-filter, an activated carbon filter and True HEPA filter. It is easy to operate, and is extremely quiet. It’s fairly light weight, so easy to move around with its handle on the back, and has many other bells and whistles that you can take advantage of, depending on what kind of air you are trying to purify. 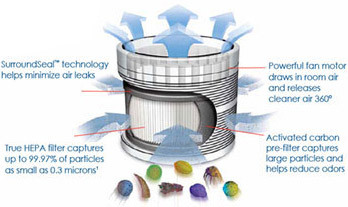 The pre-filter works to trap larger particles of pollution. “Bad air” then has to face it’s second challenge, the activated carbon filter, which traps smells and gases. After these two filters, your space should be relatively clear of most dust, lint, pet dander and other common allergens. Last and not least, the HEPA filter captures 99.9% of airborne irritants over a microscopic size, after accounting for all of the irritants taken out in the previous two filters. Mold spores, viruses, dust mites, germs, random debris, pollen, and bacteria are effectively filtered. The Whispure AP51030K has four speeds, all of which are relatively quiet. I’ve brought it upstairs many times and used it in my bedroom while I sleep. I would recommend anyone do this. The Whispure AP51030K is best for rooms up to 500 square feet, which is why I use it in my basement, which is about that size, and fairly open. Its boasts an incredible CADR of 315 cubic feet of clean air delivered per minute. The Whispure AP51030K has an ACH rating of 4.8 changes per hour, which is very good (but not as good as top of the line models that cost more). It uses 115 watts of power, which is on the high end, but for the price of the machine, it’s not a bad trade-off. In some locations, Whirlpool supports your purchase with a 5 year manufacturer’s warranty. You can also vaccum the filter when the light turns orange, and simply put it back in for another turn. Despite the fact that this is one of the best overall machines at this price range, the pre-filter isn’t the best among air purifiers in this class, but the HEPA filter more than makes up for that. Some people find that it runs a little warm, and that the carbon filter was larger to be more effective. The design is maybe nothing to write home about but “function over form” definitely applies here. It doesn’t look bad, it just is what it is. The operational panel at the top is easy to use and understand, but you may need to reference the manual if you don’t use it that often and want to adjust some settings. The Whirlpool Whispure AP51030K is very strong in a field of competitive air purifiers. It is a work horse doing the job of filtering your air, quietly, and there isn’t much more to it than that. It’s features and controls are all standard, and I highly recommend it. Please feel free to ask any questions or check this model out on Amazon.